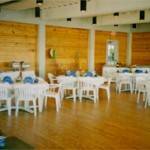 The Lake Room Located on the main level of the clubhouse, the Lake Room has sweeping views of Portage Lake, the marina, and the beach. It has natural wood floors and glass walls on both the lake and beach sides, and also features a gas fireplace. The Park Room The Park Room is also located on the main level of the Clubhouse and has views of the Club’s shaded picnic grounds (“The Park”) as well as Portage Lake and the marina. It has natural wood floors and glass walls on both the park and lake side. The Upper Decks Completely open and located on the second floor of the Clubhouse, the Upper Decks offer panoramic views of Portage Lake. The decks have concrete floors and 42-inch railings. There are both interior and exterior stairways to the main level, as well as elevator access. This area is WEATHER SENSITIVE! The Game Room Also located on the second floor of the Clubhouse, this serves as the club’s “game room.” It is carpeted and opens to both Upper Decks. It is frequently used in association with parties on the Upper Decks for food and beverage service. The Park Our park rental is a perfect setting for a barbeque or picnic for groups of up to 144 using our 30×60 rental tent which is surrounded by two acres of shade trees and grassy open areas, with picnic tables and Weber grills included. 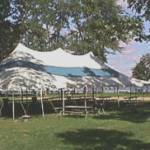 A 20×20 rental tent is available for smaller groups. Food and Beverage PYC’s excellent food service can supply your function with a wide variety of brunch, lunch and dinner item choices. Our expert staff will help tailor your menu to meet the exact needs of your individual function, whether relaxed or formal, and for most any theme. Outside catering is not permitted, with the exception of wedding cakes, for events within the clubhouse. Suggested menus and prices are available. 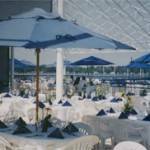 Our capacity to service your special event depends on how it impacts membership use of the Club. May thru September, we can accommodate an event of no more than 84 people enjoying food, drink and entertainment. 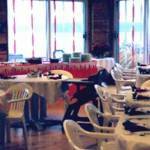 Events anytime during the October thru April period, we can accommodate an event of up to 150 people. PYC’s beverage service includes several non-alcoholic choices a nice selection of wine and beer as well as a top shelf selection of liquors and liqueurs. A beverage list is available, and bartender service is offered as well. The Michigan Liquor Control Commission dictates that members and guests may not bring alcoholic beverages purchased off-site into the clubhouse or onto the attached decks. In addition, members and guests may not take alcoholic beverages from the clubhouse or decks to the park, parking lots, or marina, and only members may purchase alcoholic beverages. Therefore, any person contracting for alcoholic beverage service must at least have a Dining membership. Alcoholic beverage service closes at least 30 minutes before the end of the rental period if the rental period runs later than 10:00 p.m. Entertainment All musical entertainment must be contracted through your PYC Event Coordinator. NOTE: We will not permit loud and/or disruptive music or noise to be exported from the premises. PYC management shall always have the right to control the decibel level. No outdoor music will be permitted beyond 11:00 p.m. NOTE: Neither distribution nor encouragement to use tobacco products in the Clubhouse or on the decks will be allowed.